Memories of Ash – Why Intisar Khanani might be a YA fantasy goddess. 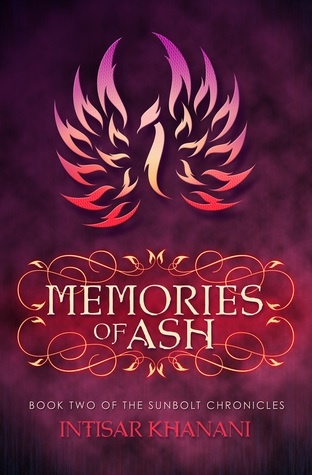 Intisar Khanani has been on my must-read list since I first encountered Thorn, but she has really, really shown what she can do in her latest book, Memories of Ash. This is a sequel to Sunbolt, which reads more like a novella, so it doesn’t take long to read and it is absolutely worth your time. It only hints at how awesome this series is going to be, though, because Memories of Ash took things to an epic level. Khanani is an indie writer, but she is one of the best I’ve ever read. I would seriously wager on her in a write-of with some of the biggest names in YA fantasy, and you can snag her ebooks for about $4!!! If you love your leading ladies strong, and your settings exotic and magical, you can’t go wrong with this book. I gave it a solid five stars. I put this one down after a straight read through and all I could think was WOW!! Fans of Sarah J. Maas, Rae Carson, and Leigh Bardugo will fall in love, not only with the determined yet vulnerable Hitomi, but also with the plot which blends action, adventure, magic, loyalty and betrayal in an irresistible way. Hitomi, through a powerful spell, has lost her past, but her future is the one thing she is determined to hold on to, and if that means making bargains with mystical creatures, trekking through sun baked deserts, or following through with one of the more impressive jail breaks I’ve encountered, well, so be it. The secondary cast isn’t too shabby either – they boast a surprising depth and almost no one is precisely who he or she seems. And they populate a world as vast and unexpected as any fantasy reader could desire. Honestly, the only complaint I have about this stellar sequel is that it left me with a terrible book hangover and the ennui that always accompanies the wait for the next book. I will gladly wait, though, because this book just went to the top of my favorite reads of the year. I can’t wait to share it with my high school readers, particularly those who enjoy a great female protagonist. It is definitely going on my classroom library wishlist, and it is a book I know I will revisit and linger over again and again. Language and situations are appropriate for grades 7+, but adult readers will find it just as compelling. I received an ARC from the author (thank you, thank you, thank you) in exchange for an honest review. You couldn’t pay me to gush like this if I didn’t mean it!